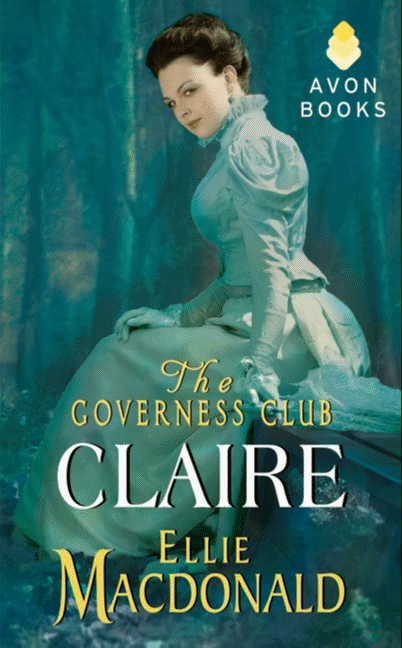 She's currently on tour to promote the first two novellas in her The Governess Club series: Claire and The Governess Club: Bonnie. To see where else Ellie is stopping by, click here. Four regency misses, making their ways as governesses, make a pact work together in order to leave London and support themselves in the country. Thus, the Governess Club was born. But little did they know that their heroes might have something else to say about the matter. Claire Bannister just wants to be a good governess so that she, and the other ladies of the Governess Club, can make enough money to leave their jobs and start their own school in the country. But when the new, sinfully handsome, and utterly distracting tutor arrives, Claire finds herself caught up in a whirlwind romance that could change the course of her future. Jacob Knightly has a secret. He’s actually the notorious Earl of Rimmel. He’s just posing as a tutor to escape his reputation in the city. He never expected to fall in love with the beautiful and kind governess. She is the first person to love him for himself and not his title. But when Jacob’s true identity is revealed, Claire realizes she has risked her reputation and her heart on a man she doesn’t truly know. Will Jacob be able to convince her that the Wild Earl has been tamed and that she is the true Countess of his heart? Click here to read an excerpt for Claire. Miss Bonnie Hodges, governess to the Darrow family, is desperately trying to hold it together. Tragedy has struck and she is the sole person left to be strong for the two little boys in her care. When the new guardian arrives, she hopes that things will get better. She wasn’t expecting her new employer to be the most frustrating, overbearing, and ... handsome man she’s ever seen. Sir Stephen Montgomery is utterly distracted. He should be trying to figure out how his two best friends were killed in a suspicious accident and why the new young viscount seems destined to be the next victim. But he can’t concentrate on anything but his growing feelings for the beautiful, mysterious, and utterly captivating governess. Together they put their heads together to save the two young boys but will Stephen’s feelings for Bonnie get in the way of their search for a killer? Click here to read an excerpt for Bonnie. Bonnie Hodges serves as governess to Henry and Arthur, the young sons of Viscount Darrow. After she and the boys witness the horrifying accident that kills the Viscount and his wife, Bonnie has no choice but to delay her planned resignation from Darrowgate, waiting for the boys' guardian to arrive. Sir Stephen Montgomery hadn't expected the welcome he receives at Darrowgate. His closest childhood friend is dead only a week after sending him an ominous note. Sir Stephen had come to help his friend investigate the strange accidents -- he had not expected to investigate his own friend's tragic death. There is something afoot here, Stephen, and I cannot put my finger on it. My worry increases daily, not for myself, but for my family. Small accidents are becoming larger and harder to explain away and no longer involve only me. You must come, I beg of you. You have always had a knack for ferreting things out. The safety and well-being of my family depends on it. There is no one I trust more. There is more to the mystery than what the late viscount had written about: not only was there a trail of mysterious accidents but also a trail of bad business investments -- and it takes all of Sir Stephen's time and energy to untangle the knot of lies, questions and decisions that lay before him. Add to his added burden is Bonnie's insistence that he act as guardian to the boys. It grates at Sir Stephen to be told of his responsibilities -- he has no choice but to continue to work and live with Bonnie, whom the boys are attached to and who continue to irritate (and fascinate) him with each passing day. Two people put in an unusual situation brought about by unusual circumstances -- And drawn to one another by an inexplicable attraction. Try as he might, Stephen cannot help but see Bonnie as a mere governess -- Bonnie who courageously stands up to him and speaks up for her charges' well-being. And Bonnie knows of the dangers of falling in love with her employer -- but Stephen and his dreams of a family prove irresistible. He felt so deep in the hole he had dug, Stephen thought he would take a risk. "For instance, if we were married, I wouldn't be standing here." She looked at him in question. "You wouldn't?" He shook his head. "I would be sitting beside you, like this." He put his actions to words and settled on the sofa beside her, not close enough to touch, but he could feel her heat. "I might even sit like this." He stretched his arm along the back of the sofa, his sleeve brushing her shoulders. Bonnie cleared her throat. He was so close she could smell the sandalwood cologne he wore and tingles radiated along her shoulders where his sleeve brushed them. "Might you?" "Aye. I imagine many evenings spent like this with my wife, just the two of us." Ellie MacDonald continues to build on the compelling world of governesses in her latest installment of The Governess Club. In Bonnie's story, MacDonald showcases her skillful hand at painting a murder mystery: who wanted the Viscount killed and why? The mystery deepens when more accidents happen: this time to Bonnie and the two boys. I really enjoyed reading about Sir Stephen's methods of investigation -- his deductive skills reminded me of Sherlock Holmes. He's observant and logical and able to think on his feet -- but what is most amazing about Sir Stephen is that he does not disengage from the people around him. All of his actions, his decisions always takes into consideration the welfare of the two boys and of Darrowgate. What really shines through in this story is the growing bond between Sir Stephen, the two boys and Bonnie -- like it or not, each interaction was a string that eventually tied them all together as a hodge-podge sort of family. The irony was not lost on me: Sir Stephen's own childhood wasn't a happy or idyllic experience but it is a testament to his own personal character that he learned from the mistakes of his own parents and is applying the lessons to how he is raising Arthur and Henry. And it's interesting that, the position that caused her mother's ruin is the same position that restores Bonnie. 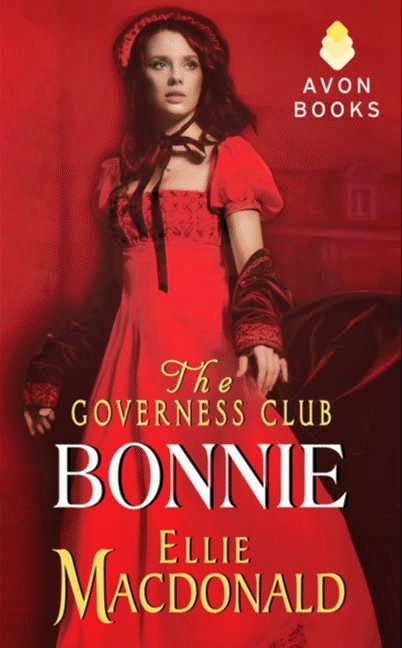 The Governess Club: Bonnie is a very compelling book with nail-biting/exciting and heartwarming moments. It is the second installment in Ellie MacDonald's The Governess Club series. Definitely looking forward to reading the next one! Disclosure: I received this book from the tour organizer (via Edelweiss) as part of the book tour. Thank you to Tasty Book Tours, to Ellie MacDonald and to Avon Impulse for the opportunity. Yes, this is an honest review. 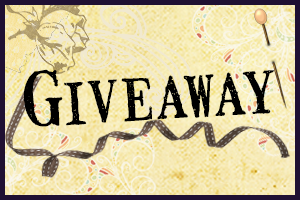 There is a tour-wide giveaway of Two (2) digital copies of Claire: Book One in the Governess Club Series. Good luck! When I first saw these novels, my mouth dropped open because I am a huge “sucker” for novels about governesses. I cut my teeth on them years and years ago and I wish more authors would write stories about them. I cannot WAIT to read these and would love nothing more than to be selected as a winner! Wahoo! These sound like such great reads! I can't wait to check them out. Congratulations on the publication of The Governess Club! Love historical romance and would love to win a copy of these books. Thanks for the great giveaway. These sounds like fantastic books. I love historical stories. I look forward to reading these and have them on my TBR list. I delighted in over read your blog entry. Your blog have pleasant data, I got smart thoughts from this astonishing online journal. I am continually seeking like this sort blog entry. Jim Corbett National Park lies in Uttarakhand. It's the whole area surrounded by hills, rivers, grasslands and a large lake. Printable January 2018 Calendars With Holidays UK- We provide editable and vibrant 2018 January Calendar UK. calendar printable template with holidays usa Our collection is composed of templates in a variety of formats such as Word and PDF. Really great article...keep writing Use any of the following services free checking with interestand your entire balance will earn interest: Monthly direct deposit Treasury management services. Independently establishing and managing a (regional) treasury centre or in-house bank requires a significant financial and timeTreasury management services. Independently establishing and managing a (regional) treasury centre or in-house bank requires a significant financial and time Kasasa checkingKasasaFree checking, awesome rewards. We believe in rewarding account holders.